Front of House NYC is a creative hospitality marketing agency. As their first official full-time hire, I worked as Account Director, overseeing 8 different clients, the merge of our company with another boutique markeitng agency, and the onboarding of many new ones. I also managed a team of 6 account managers, photographers, and designers. Here, I'll take you through the process of helping one of my clients, Uma Temakeria, open up their new location in Gotham West Market in Fall of 2015. 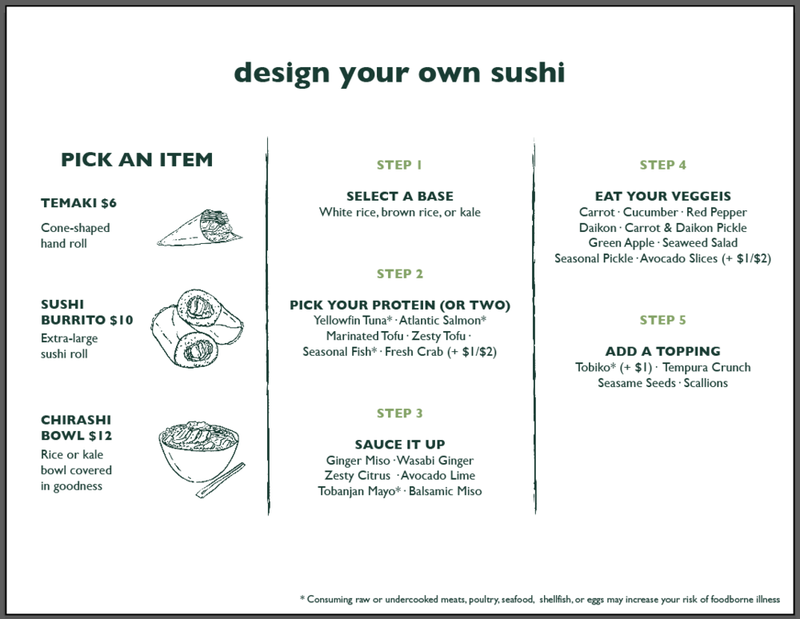 Uma Temakeria is a fast-casual sushi spot with two locations in Chelsea and Gotham West Market. Created by Chef Chris Jaeckle. 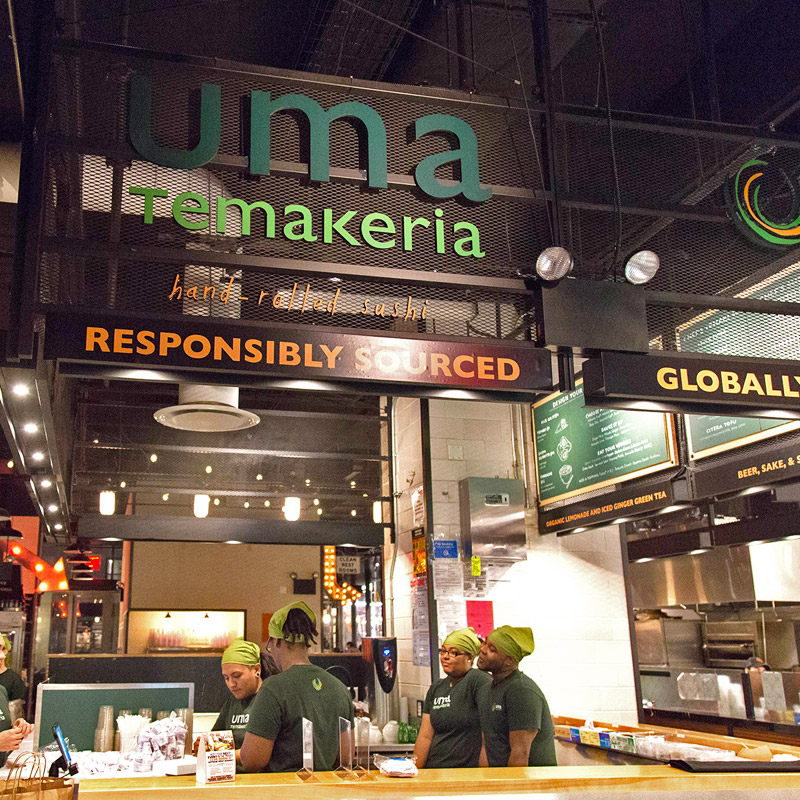 Uma Temakeria was opening up their second location inside Gotham West Market—which was a very different local market than in Chelsea. Additionally, they would be in a food court, so they would be directly competing with other vendors in the space. Uma needed help with the buildout of their new storefront, a successful launch party, and a hyperlocal marketing strategy that would connect them with their new audience. NYC has a plethora of restaurants; any new restaurant must take the culture of the immediate surrounding market into account in order to best connect with the people there (i.e. opening up a place in Bushwick is v. different from opening one in the Upper East Side). Uma Temakeria was opening up in Gotham West Market—an area surrounded by new residential buildings and prominent company offices like Ogilvy. I couldn't use the same marketing tactics that we were using in their other store in Chelsea, which was located close to many universities. Because most of our clients were restaurants, bars, and hotels, we had to think of both digital marketing touch points as well as in-store ones to tell Uma Temakeria's story to a new audience. To organize our creation of marketing campaigns, I created this general reference guide to help us think through possible promotions. In addition to creating marketing strategy, we also helped Uma Temakeria with their new signage and menu board designs for the new space. We visited the space with our client and chatted through the setup of operations, customer flow, and various touch points. To the right, you'll see a brief diagram I sent over to our designer to create a mockup of the new signage we fabricated. A new location meant a chance to redo the design of the menu; the original one was confusing and didn't present their brand in the most modern and current way. And so, I redesigned them to be much clearer to the customer, which included a list of steps of how each item is put together. I also worked with an illustrator to create custom hand-drawn icons. You can see the menu on the left. We worked on social & marketing collateral and influencer outreach for the launch party. This included the creation of a live social media feed, designing napkins & menus, and working in conjunction with Uma's PR agency. Over 200+ guests enjoyed this launch party at Gotham West Market. After the storefront buildout and launch party, our job definitely wasn't over. Then, it was all about raising awareness that Uma Temakeria had a brand new location—to both existing customers and new audiences. One of the campaigns that we worked on was with the Real Estate owner of Gotham West (the building) and reaching their tenants with custom-designed cards that would let them know about Uma Temakeria. During this campaign, we focused on giving this new audience something of value, which was a free hand roll, in order to begin to build a relationship with them. You can see the design to the left; I worked on the copy, design, and also execution of the campaign.